Like most other HTC devices, the Rhyme has a great build quality. At first glance, you can see that it is heavily inspired by the HTC Radar’s design. The 3.7 inch S-LCD display on the phone is impressive-sharp details with good sunlight legibility, but it really can’t compete with an amoled display that Samsung offers. 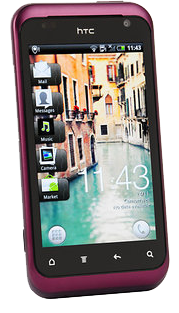 HTC Rhyme come with an additional and totally different accessory called Charm. It is a small cube that flashes up to indicate an incoming call or SMS. It connects to the phone’s 3.5mm audio jack, which means that you can either use headset or Charm at a particular time. Even the loudspeaker switches off when Charm is plugged-in. It could be useful in meetings or maybe in the movie theater where you can keep the ringer off and have the charm notify you of calls and messages.